If occasional flat ironing your hair gives you the versatility of your dreams, doing these three things both before and after will minimize potential heat damage. The ingredients in your shampoo matter. Not only do you need something strong enough to totally rid the scalp of any dirt, product build-up and impurities, but there needs to be a moisturizing factor included as well. Sulfate-free shampoos are great, especially for natural hair, as they thoroughly cleanse without the detergents that strip hair. Look for a cleanser that contains hydrating fruit extracts and nut oils. Argan and olive oils work together to neutralize the strong detergent ingredients a shampoo may have in order to help your curls keep their soft, uniform appearance and feeling after you're done rocking a straight style. Argan Smooth’s Epic Moisture sulfate-free shampoo thoroughly deep cleans while adding moisture back into the hair. While every curly head is different, it is possible to use a shampoo too frequently or not enough. Finding the perfect balance is the key. Look for the following signs: Does your scalp get greasy fast? Is your hair struggling to retain length? 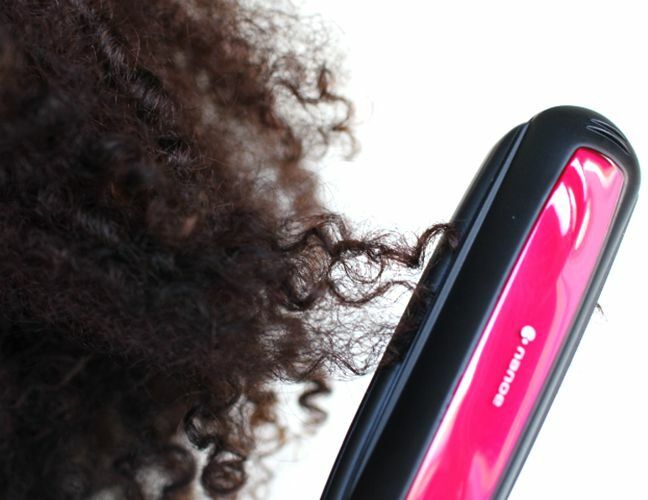 Do you notice a ton of frizz at the top layer of your curls? Does your head itch often? If you're going to straighten your hair for a special occasion, use a deeply moisturizing reconstructive treatment that is known to soften and smooth down particularly coarse, frizzy textured hair. Doing this for 30 minutes to an hour should be fine, depending on your hair's porosity level--but overnight isn't necessary. Use a masque or treatment that contains shea butter to deeply penetrate the hair shaft and give your curls their highest level of moisture before (and after) utilizing a heat styling tool. This will balance and restore your curl pattern, as long as it was a one-off occasion. Try the Baggy Method for sealing in the most amount of moisture: Use saran wrap or a plastic bag to trap steam and help your product penetrate your texture. Seal that moisture in with a sealant like the Argan Smooth Leave-In Softening Sealant that comes in their Silk Press Natural Hair Thermal Straightening System. Maintaining a straightened hairstyle can be challenging if there is even a little bit of texture in the hair. Use a heat protectant like the Argan Smooth Silk Press Crème to coat your hair for a few reasons: to keep the style in place as long as you want it, and to act as a barrier between the heat application and your natural hair. Silk Press Crème seals and smooths cuticles, and evenly distributes heat throughout hair, so that “hot spots” (spots throughout the hair where heat concentrates and weakens it) do not occur. In the worlds of all-natural and do-it-yourself, argan oil has been proven to be an effective super ingredient for protecting naturally curly and coily hair from excessive heat damage. Use argan oil products before reaching for the flat iron, and remember to never let the tool sit on a single part of your hair for more than a couple of seconds at a time. Constantly let it pass through your strands, allowing for the lightweight oil to produce a silky and moisturized straightened style at its healthiest and least damaging. The Argan Smooth Silk Press Natural Hair Thermal Straightening System is a kit for curlies who are looking to straighten their hair temporarily (there is no chemical straightening involved). It contains their Epic Moisture Shampoo to cleanse the hair before straightening, the Strengthening Miracle Hair Masque to deeply condition, the Leave-In Softening Sealant to seal in moisture and the Silk Press Crème to protect hair from heat damage and maintain your heat style. Silk Press Crème also smooths cuticles, causing them to lay flat, which helps keep the style frizz-free, smooth and straight. This post is sponsored by Argan Smooth.